We take providing the highest quality care for you and your child very seriously. In order to do so, we have implemented a number of programs. We ensure our staff has the latest training and that our parents are well informed. The children are assessed to make sure they are getting the individual attention and support they need to succeed. We work closely with the Sacramento County Office of Education (SCOE) in the Quality Rating Improvement System and with Child Action to make sure we have the latest tools and resources available so that children at Something Extra have the best start possible. We use this parent assisted tool because early and accurate identification of infants and young children who have developmental delays is key to the timely delivery of early intervention services. Establishing a comprehensive, first-level screening program is the first step in obtaining needed services for infants, young children and their families. This is a tool used by teachers and is a developmental continuum from early infancy to kindergarten entry. The DRDP is administered in natural settings through teacher observations and examples of children’s work. There are 66 measures in the Preschool DRDP and our curriculum is shaped by these measures. Our instruction is individualized based on these results and those from the ASQs. We send the ASQs home twice each year for parents to fill out. Then we have parent-teacher conferences to discuss these findings along with our findings from the DRDP and to show work examples that are being completed for the child’s portfolio. What If My Child Is Developmentally Delayed? We work closely with Child Action. This partnership gives us access to a myriad of programs to help children and their families. 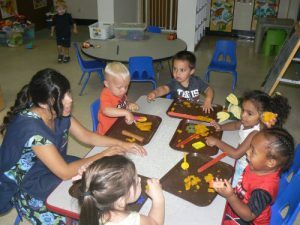 Just one example of these programs is called the Quality Childcare Collaborative (QCC). The QCC is a group of professionals from many areas such as occupational therapy, special education, speech therapy, behavior specialists, health coordinator, infant-toddler specialists and reflective practice specialists, just to name a few. With your permission, we are able to have your child observed by one or more of these specialists. Once the specialist has observed your child the teachers are given information to help your child. This same information is given to you, the parent, so we are all working on the same page to do what is best for your child. Parents also receive resources to get the referrals needed for help on an ongoing basis if needed, for example with speech therapy. Our teachers participate in professional development on a consistent basis. As part of our partnership with SCOE we are required to attend at least 21 hours of professional development each year. This is a priority and we really enjoy the boost it gives us when we bring the information back to our classrooms and make it come alive. We are rated in several different areas so that we know where our strengths are and where we need a little improvement. SCOE rates us in the following areas once a year, they provide us with our scores and ways to improve where we need it. This is a rating for interactions, teacher to child, child to teacher and teacher to teacher. Before they walk and talk, they interact. Interactions between caregivers and children matter - in a big way. These interactions lay the foundation for all subsequent development, making a focus on strengthening connections absolutely critical for improving child outcomes. The CLASS for infants includes measures on how caregivers provide infants with a secure base for exploration, how they respond to their needs in sensitive ways and how they encourage early language development. 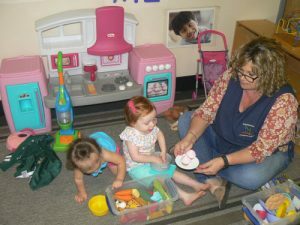 The CLASS for toddlers includes measures on how caregivers help children establish autonomy, support children as they make connections between things they learn and how they guide children as they learn to regulate their behavior. 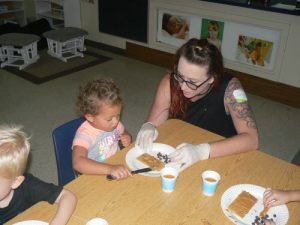 The CLASS for preschool and Pre-K includes measures on how caregivers foster a secure, supportive base for learning and exploration, how they help children further develop language and cognitive skills and how they construct the environment and experiences that help children develop their abilities. This is a rating for our environments. The ERS define environment by the arrangement of space both indoors and outdoors. It also oversees the materials and activities offered to the children, the supervision and interactions that occur in the classroom. The ERS will control the schedule of the day - including routines and activities and the support offered to parents and staff. Assessing the quality of a preschool in this way has been more predictive of child outcomes than structural indicators such as staff to child ratios, group size, cost of care or even type of care. The Program Administration Scale (PAS) is a valid and reliable instrument designed to measure the leadership and management practices of early childhood programs. The PAS provides valuable information to directors about the quality of their administrative practices.